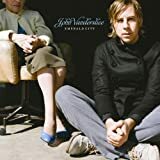 John Vanderslice is simply one of my favorite singer-songwriters.His smart lyrics combined with spot-on production make every JV release a highlight of my musical year. Emerald City is out tomorrow, and since its arrival has spent more time in my CD player than any other album. John Vanderslice albums always start strong and finish even stronger, as with his previous releases I was blown away by my first listen, and appreciate Emerald City even more with each repeated spin. Other new albums I can highly recommend this week include Bishop Allen's long anticipated The Broken String, Tegan and Sara's The Con, and the Simpsons movie soundtrack (even though I haven't heard it yet). Reissues released this week include MF Doom's MM.. Food? (with a bonus live DVD); two Harvey Milk discs, Pleaser and My Love Is Higher Than Your Assessment of What My Love Could Be; and Sebadoh's indie classic The Freed Man (remastered with bonus tracks). Have I left anything noteworthy off the list? What new music releases can you recommend this week?